Krull – Main Theme by James Horner… And More Snippets! Today I’m sharing the late James Horner’s epic opening music to this 1983 science-fantasy classic Krull! Horner was a composer of many beautiful film scores, and tragically passed away too soon in a plane crash last year. However, I’m honoring some parts of his legacy that inspired me growing up in my book viva tribute to some of the films he lent his great talents to. 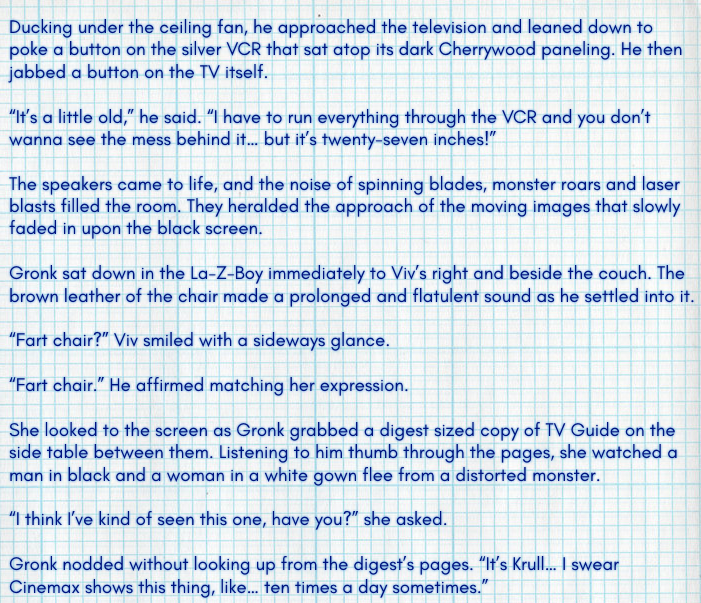 Krull, a movie that was a staple of my childhood, gets a few nods in my 1980s fantasy novel-in-progress, Vivian’s Last Cigarette. The funniest of which I’ll share below from chapter five. I like this little bit because, beyond nostalgia, it comes at a point in the story where it not only serves to further develop the growing relationship between my two protagonists… but also as an illustrative metaphor. Ha-ha! Good times. :-) My quarter-bane was TRON, although my favorite classic movie tie-in coin-op was the Star Wars vector game.